:Harriet, Darwin's pet tortoise, and Milton, Schrödinger's indecisive cat, continue their time-travelling quest. On this adventure they investigate our place in the universe, travelling from the Islamic Golden Age to the Renaissance and meeting Galileo along the way! The Curious Science Quest looks at the evidence behind the BIG questions scientists have asked throughout history. But does science explain everything, or can faith help us find the answers? Join this fun, fact-filled time quest, and remember to bring some snacks! 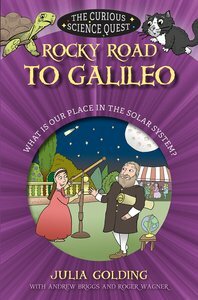 About "Rocky Road to Galileo: What is Our Place in the Solar System (Curious Science Quest Series)"